Availability Please contact us for availability. Adjust individual needle speed from 400 to 1000 Stitches Per Minute. 10 Full Spectrum LED Lights above needles has the brightness of 35 light bulbs and eliminates shadows. 10 Lights in the InnovaChrome LED Thread Color System. 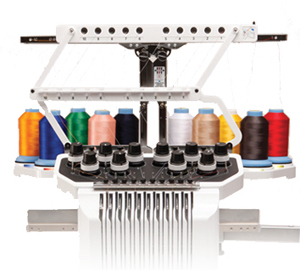 LED Lights below each of 10 spool pins on the thread stand are color coded to match 10 of up to 300 thread colors shown on the screen. So you can never mismatch thread spool color indicated on the main control panel. These lights also flash to advise of thread color change, thread breakage, design completion, and empty status. 6 Hoops, 4 Flat up to 8x14", Ear to Ear 270° 2 3/8 x 14" Wide Cap Frame Hoop, Cylinder Hoop. 110 Built-in Exclusive Embroidery Designs. 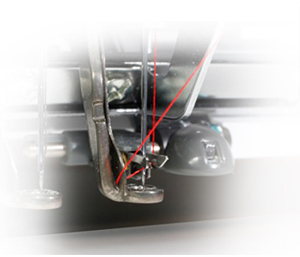 InnovEye® Technology and Snowman Embroidery Positioning Marker from Quattro NV6000D: built-in camera above the needle that is sewing. Precise positioning of your center and starting point is easy with the 200% actual size zoom and visual grid function. 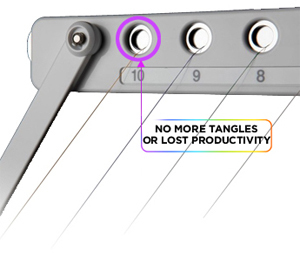 Use the InnovEye to view any thread breakage point, then select the grid function to determine the spot to restart your embroidery. Snowman® Embroidery Precise Positioning Marker using needle camera for perfect placement, matching the angle of your embroidery to the angle of your hooped fabric. Impressive 10-color, 50,000 stitch-count designs can be completed 12% faster than with a six needle machine, and more than 30% faster than with a single-needle machine. With the PR-1000, you truly can enter the next dimension in creativity and productivity. The PR-1000 promises virtually perfect thread tension every time with the Eyelet Threading System, a Brother® exclusive. Perfection is all about consistency, and the exclusive Eyelet Threading System from Brother provides both. As the only multi-needle machine with a built-in automatic needle threading system, you'll thread each needle in seconds — with just the touch of a button! See thread pass effortlessly through the eye of each needle. No more struggling to thread the needles! Defy embroidery as you've always known it by stitching designs up to 10 colors without changing thread. Many 20-color designs can be completed with just two thread changes. And for variety, switch to monochrome mode to stitch multi-color designs as one color designs. 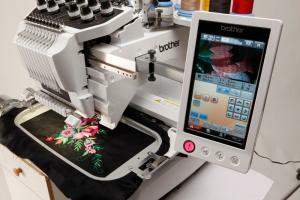 The color selection and threading of a multi-needle embroidery machine has never been so intelligent! The InnovaChrome™ LED Thread Color System is the first of its kind, and as you'll see, IT'S simply amazing! 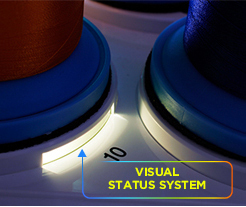 Underneath each of the 10 thread spools is a full color LED light which mimics the color of the thread that belongs on the spool for each design, eliminating any guesswork as to what color thread should be used. Thread selection has never been so easy—or fun! Match the thread colors needed in your designs, using the LED under each spool. The LEDs are calibrated to indicate the closest color from the hundreds of colors used in standard design color palettes. LEDs correlate to thread color information shown on the LCD screen. The lights also double as a visual status system so you can spend less time supervising your machine. When your design is finished, the InnovaChrome™ System calls you back to the machine with a special light show. The lights even flash just to say “Hi” when you turn the machine on!